This past Friday was the deadline to submit amicus briefs to the Supreme Court for their upcoming ruling on Prop 8, California's gay marriage ban. While noted comedian, talk show host and and vest with scarf-wearer Ellen DeGeneres did not submit a brief directly to the Supreme Court, she did post an open letter on her own blog with the hope that someone would tweet it to the high court on her behalf. Unsurprisingly, she was real heartfelt and funny about it. California's Proposition 8 is headed to the Supreme Court. Hundreds of companies and families as well as Republicans are submitting briefs urging the 9 judges to allow gay people to marry. I thought that was ridiculous. Why would judges want all of that underwear? Then, after a quick talk with some people, I found out what a brief was. I've never filed a brief to the Supreme Court, so I thought I would post mine here. I'm sure someone will tweet it to them. Portia and I have been married for 4 years and they have been the happiest of my life. And in those 4 years, I don't think we hurt anyone else's marriage. I asked all of my neighbors and they say they're fine. 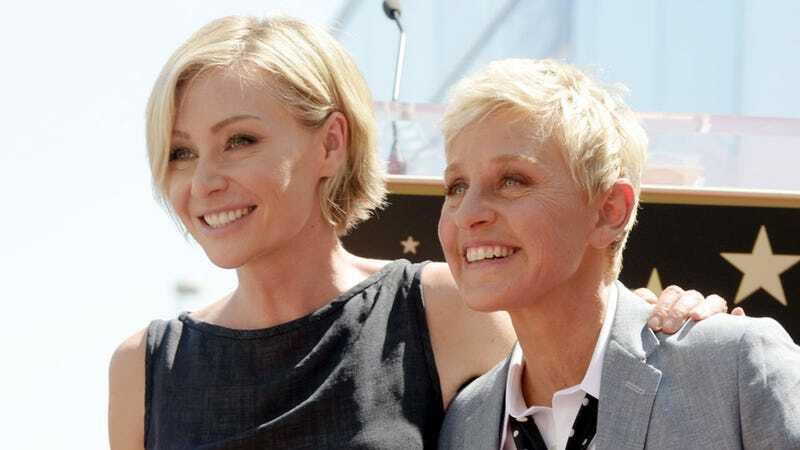 But even though Portia and I got married in the short period of time when it was legal in California, there are 1,138 federal rights for married couples that we don't have, including some that protect married people from losing their homes, or their savings or custody of their children. The truth is, Portia and I aren't as different from you as you might think. We're just trying to find happiness in the bodies and minds we were given, like everyone else. Coming out was one of the hardest things I ever did. I didn't intend to be on the cover of Time magazine saying, "Yep, I'm gay." The truth is, I don't even remember saying that. I mean, I definitely said the "I'm gay" part. It's the "yep" I don't remember. I'm not really a "yep" person. "Yes siree Bob" maybe. But not "yep." In the words of Benjamin Franklin, "We're here, we're queer, get over it." And there's another famous quote that says "A society is judged by how it treats its weakest members." I couldn't agree with that more. No one's really sure who said it first, so if anyone asks, tell them I said it. I hope the Supreme Court will do the right thing, and let everyone enjoy the same rights. It's going to help keep families together. It's going to make kids feel better about who they are. And it is time. *I was just told Benjamin Franklin did not say that first quote. I apologize and see that I have a lot to learn about stuff. Okay, Supreme Court. Just get it together and gay people get married already. This debate has been tiresome and embarrassing from the get-go.